Hello! I didn't quite know where to put this, so I thought general questions would be sufficient enough. I've been hearing of stones, smoothed by the ocean, and holed by the waves. They say that if you make a wish upon one of these stones, you'll get the wish, but if you wish for someone else all your dreams will come true. I have also heard people talk about another type of wishing stone, one covered in white lines that has the same sort of rules as the former. I'd like to know, does anyone have any experience with these? How does one wish with one of these? And are they fake? The below reference on ordinary stones may help, or not. Stone stroking is a means of mentally getting in the zone or the magical mind-set. The stone is stroked & 'the intent repeated as a means of occupying the conscious mind while inwardly focusing on the slightly altered consciousness state of knowing that the thing is already done or in other words "making a wish." A light trance state frees the mind to experience knowing. This can be done by stone stroking with chanting & rocking the body slightly & steadily to self-hypnotize. The stone's appearance as smooth for healing, encircled with a line for wishing or crisscrossed by multiple lines as a map act as symbols to the unconscious mind. (Holed stones aren't usually stroked & have a different function as good luck charms.) When "knowing" is achieved it can feel as if a window opened in the mind letting in fresh air & light. That's the best i can describe the feeling in light trance. Stone stoking is more than holding a rock & making a wish. It's knowing how to make a wish. Checkout this other post on magical uses of ordinary stones. To know, to will, to dare & to be silent are states of mind. They form the "Witch's pyramid" or "four powers" & come from Hermetic teachings. Witches, being poor, plain folk just borrowed the language for what they already knew, as I see it. But it's basic magic principles. Those pictures you've posted really help. When I look at a stone with a line I see the three-worlds symbolism and the plane of the ritual circle. The line divides the surface into 3 parts - above the line, the line itself, & below the line. That line also forms a ring around the stone or a circle. All the "stuff" witches do is contained in the meaning of that circle symbol that exemplifies our whole conception of magical know-how. Uniting the 3-worlds of cosmic, mundane & unseen worlds is achieved thru the action of casting a circle, which itself is balanced by the five elements that "squares a circle" (:-:) & represents the corners of the temple holding the circle in place & is the same meaning as calling the quarters; & the celestial pole is seen as uniting heavenly, earthly & underworld realms at the center of the world (Omphalos) & the crossroads of the four cardinal directions of the earth. When a person stands in the center-of-one's-being or the center of a circle then one is equally present in all three realms & thus is able to do magic. So a simple ring around a stone is a picture of magical ritual & puts the mind into the zone of magical thinking. That's what symbols & ritual do to make magic happen & is knowing how to wish. One interpretation of holed, holey or hag stones appears to be as ancient symbols associated with primordial creation, depicting the entrance of the cosmic womb thru which souls enter life & exit in death. Holed stones (3-ft tall) were used as altars at Gobekli Tepi, a 13,000 year old multiple stone circle ritual site. Thus the holey stone is an ancient, protective charm with power over life & death. They are often seen braided into witches ladders & threaded as pendants to be used as potent reminders of the power of Creation, the powers of Life. Primitive thinking can be very literal but grasps symbolism. I'm not sure what you mean by "are they fake?" 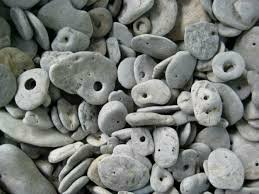 They're real stones & as such are just tools taken from Nature & serve the same function as any ritual tool - to transform the mind to move energy at Will. Maybe you thought the pebbles had some hocus pocus of their own? Only as much as Nature has endowed them to be conductors. The magic is in the mind of the user who assumes a primitive mental state of consciousness to project their Will. When you learn how it makes sense but if it's all new & the jargon is irrelevant then it's a bunch of hooey. That's as it should be. And I guess I didn't mean "are they fake." I guess I meant "are the stories true?" Or something along that line. Sorry! Re: "They say that if you make a wish upon one of these stones, you'll get the wish, but if you wish for someone else all your dreams will come true." IMO the suggestion here is to be altruistic in our intent. That's the spiritual side of magical practices. If we use magic greedily as gimme-gimmee it back washes on us like too much candy, but when we use magic to bring harmony for others that backwashes on ourselves as well & nourishes our own wellbeing. And isnt that what we all wish for? It's quite Ok to magically prompt for our honest needs. It's fine & well done to aid & nurture others. It doesn't mean life will be effortless because then we'd just get sluggish. Stones are one of mom-natures fun ways to manifest good intentions. If ya hadn't guessed I really love rocks. They sing, or if they don't know the words they can hum. I love this, the rune is a perfect rendition of the world tree. 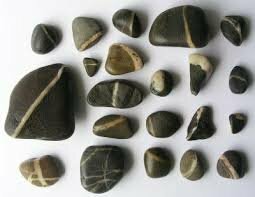 If one found a stone with those markings I would hold onto it. I suspect it would be quite protective as one traveled between the worlds. The beaches in California's central coast holds good opportunities to finding a holy stone!. Also used for seeing into the realm of fae, these stones are pretty special, I've managed to gather several. But now... do you suppose a stone that has a hole that created in other ways like a natural void rather than having been weathered are the same? Have found holes in things like lava and quartz formed this way. I feel anytime you can get through a stone with out have to drill into it then you have a magical stone. It should be capable of assisting one in breaking through difficult situations, right?